I just got the release date: April 12, 2017. It’ll be here before you know it! 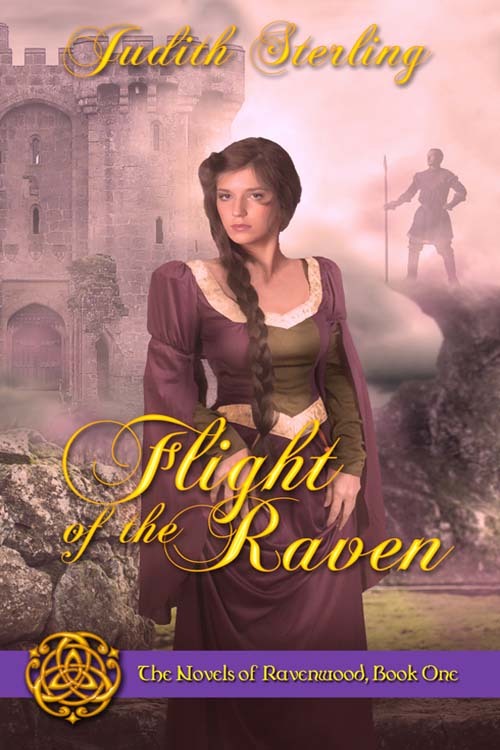 If you haven’t read Flight of the Raven, the first in the series, now would be a good time to check it out. It’s available on Amazon, Barnes and Noble, and other online retailers, and of course, from The Wild Rose Press. “I will!” And I would again in a heartbeat. 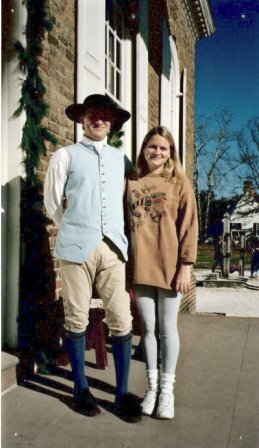 In the summer of 1999, I made up my mind to move to Williamsburg, Virginia and work for the Colonial Williamsburg Foundation. I flew into Newport News and gave myself one week to secure a job and a place to live. With dispatch, I achieved both goals, which left me with spare time at the end of said week. I ambled around CW’s historic area, wholly unaware I had a date with destiny. I schlepped along DOG (Duke of Gloucester) Street. Thanks to the heat and humidity, I thought I was going to pass out. Then I spied a divine stretch of shade beneath the entrance to the 18th-century courthouse and made a beeline for it. A young man in colonial garb with wavy, brown hair and blue-gray eyes guarded the door. I must’ve looked pathetic, because he grinned as I approached. “Can I share your shade?” I begged. We remarked on the hellish heat, shook hands, and introduced ourselves as Dan and Judy. We settled into an easy conversation, and I learned he was a native of New Jersey and had recently moved to Williamsburg with the express purpose of working for CW, just as I had. For some reason, I told him I’d studied at the University of Aberdeen in Scotland. His eyes lit up, and he explained that his ancestors had held lands around Aberdeen. In fact, Marischal College at the University of Aberdeen was founded by an Earl Marischal of Scotland. We had a number of things in common. With minimal adjustments to circumstance, we might’ve met before in England or Massachusetts. We could’ve talked for hours, but he had to get back to work. A week later, after I’d well and truly moved to Williamsburg, I was back in the historic area. This time, I explored the Magazine. All of a sudden, the memory of Dan’s blue-gray eyes invaded my thoughts. Where are you, Dan? I asked in silence. Without knowing why, I marched down the stairs and out of the Magazine. Then I crossed DOG Street and the Courthouse green in a straight line that led right to the Randolph House. There stood Dan in 18th-century costume, guarding the gate against the long line of tourists. Somehow I’d answered my own question and known where to go. Or perhaps, a part of Dan had “heard” my question and responded on a level of which neither of us was consciously aware. “Of course I remember you,” he said. That was a shocker. But I didn’t have time to react because another costumed interpreter approached us. Perfect was right. It was time for Dan’s break, and the other interpreter was his replacement. We strolled down Nicholson Street toward the Cabinetmaker. Casual observers might’ve mistaken us for longtime friends. As for me, I had a gut feeling we were meant to meet. It felt right to walk beside him. I knew on some level, I’d chosen to do so. His break was short, so we parted at Botetourt Street. But not before he asked me to dinner. That evening, he took me to a Mexican restaurant where we indulged in freshly baked tortilla chips, a tasty array of enchiladas, and a candid conversation that ran the gamut from our respective childhoods to our impressions of Williamsburg. It was a long exchange…so long that we were the last customers out the door. Even so, we were reluctant to part company. Dan suggested we go to his apartment to watch a movie. I’m surprised I wasn’t nervous. Why? Two reasons. One: he invited me to his apartment on our first date. Two: we watched Silence of the Lambs. How’s that for a first-date flick?! When the ominous soundtrack swelled above the rolling credits, it was the perfect complement to my thoughts, but not about Dan. The one and only nuisance to my nerves that night was my new job, which would begin in roughly eight hours. I turned to Dan and confessed my worries. Serenity, surrender, and a strong sense of déjà vu rushed through me. It seemed we’d sat beside each other in just that way hundreds of times before. This man will support me, I thought. He’ll protect me with his life. From then on, we spent all of our free time together. Two months later, I moved in with him. Dan sat splayed across the couch as I shuffled toward him in my bathrobe and slippers. I made a ludicrous joke, and he was gracious enough to laugh. I knelt on the couch to hug him, and his arms closed around me. He was indeed. Our engagement had begun. We had a choice about whom we would marry. Most of us in modern times take that for granted. In my first two medieval romances, the heroines—Emma, Lady Ravenwood and Jocelyn, Lady Nihtscua—must grin and bear arranged marriages, however much they object. Luckily, their benevolent creator (yours truly!) believes in happy endings…maybe because I’m content in the relationship I was fortunate enough to choose 17 Januarys ago. 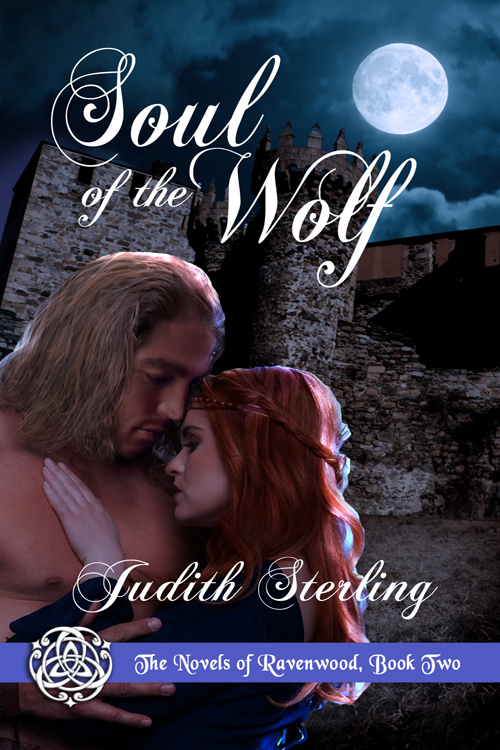 Soul of the Wolf, the second of The Novels of Ravenwood, will be available soon. The first book, Flight of the Raven, is available now. Click here! When I was nine, my paternal grandmother died of cancer. She and I were close, so I dreaded the open-casket funeral. As it turned out, the experience was quite different from what I expected. I studied her made-up face with more curiosity than sorrow. That’s not Grandma in the coffin, I thought. It’s just a shell. The air was heavy with whispers, sobs, and the scent of flowers, but I sensed my grandmother hovering at the back of the room, watching us all. When my grandfather broke down in front of the casket, she rushed to his side, faster than those of flesh and blood could. This awareness of her continued presence made the whole event seem like a bizarre play. Unsure of my role in it, I said nothing of my impressions. The next time I saw my grandmother was months later in a dream. She looked much the same as she had in life, though bliss appeared to have smoothed the minimal lines on her face. We sat together in a well-appointed bungalow, into which drifted the sound of waves crashing on a shore. We played cards and marble solitaire, and while we didn’t speak, our hearts communicated volumes. Love and peace enveloped me, but I knew our time together was brief. Suddenly, she smiled at me, and I heard her thoughts. Come. I want to show you something. We stepped outside where the sky glowed with the rosy hue of twilight. 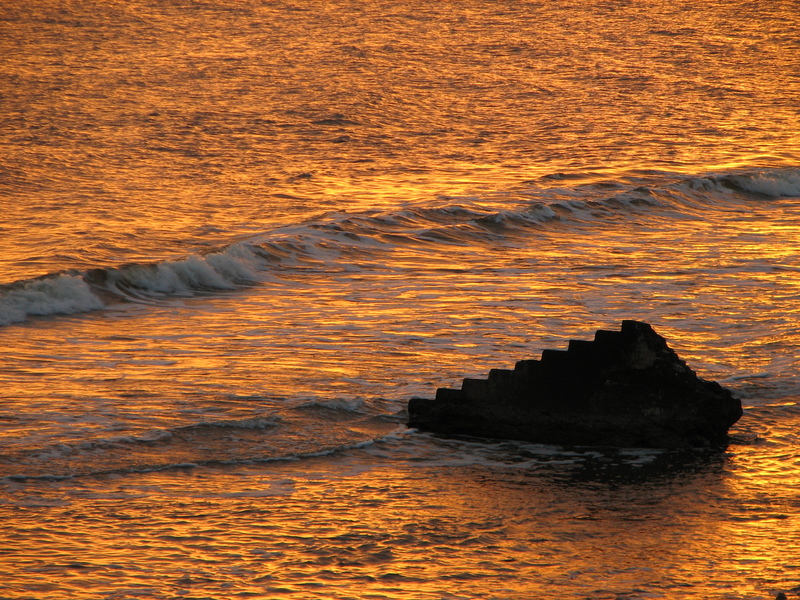 I followed her along a path of stones to a beach that seemed to stretch into infinity. Then I noticed the ocean and did a double take. The water was golden and full of light. The waves crested, but instead of curving over, they extended–as though over a box–before colliding with the sand. My mind registered the image of a square, then a cube, and finally something like a hypercube (or tesseract) rotating on a single axis. Abruptly, I awoke. I leapt out of bed, snatched a pen from my desk, and wrote in my dream journal: Grandma in a cottage at the beach. Square waves. Fourth dimension. In a daze, I climbed back into bed, burrowed under the covers, and fell asleep. At nine years of age, I had no formal knowledge of geometry or physics. When I observed what I’d written the next day, the idea of a fourth dimension was foreign. But in the moment I emerged from the dream, it made perfect sense. The fourth dimension holds meaning for mathematicians and metaphysicians alike. In geometry, a tesseract (made, in principle, by combining two cubes) is the four-dimensional analog of the cube, just as the cube is the three-dimensional analog of the square. In spiritual studies, the fourth dimension is linked to a higher frequency or vibration of energy, interpreted as the astral plane (the realm we enter during astral travel and at physical death). Apparently, we become conscious of it when beings from higher dimensions intersect with our three-dimensional reality. Maybe my grandmother paid me a visit. Maybe I traveled via the astral plane to visit her. All I know is our first reunion was as beautiful and as deep as the shining waters she revealed. This experience and others like it inevitably find their way into my writing. In The Novels of Ravenwood series, some of the characters are aware of other dimensions. They receive information through visions or dreams, sometimes from a loved one who’s crossed over. It’s historical romance with a dash of magical realism. Medievals with a hint of the mystical. I hope you enjoy Flight of the Raven and Soul of the Wolf (soon to be released). I’m currently writing the third in the series, Shadow of the Swan. Flight of the Raven is available now on Amazon. Click here! Happy New Year! First of all, a big thank you to everyone who has written a review of Flight of the Raven on Amazon, Barnes & Noble, Goodreads, The Wild Rose Press, etc. I really appreciate your support and enthusiasm. Also, congratulations to Maria Narkis, who won an autographed paperback copy of Flight of the Raven by commenting on my LASR Winter Blogfest 2016 post. On the publishing front, 2017 will be a big year. Soul of the Wolf, Book Two of The Novels of Ravenwood has been sent to production for the final galley, so I should have a release date soon. Now I’m writing Book Three, Shadow of the Swan. I’ve also contracted The Cauldron Stirred, the first book in my YA paranormal fantasy series, Guardians of Erin. The edits begin soon! That’s all for now. Wishing everyone a happy, healthy, and prosperous 2017!